The pressure is off in the vegetable garden in October. The vigorous summer growth has receded and the remaining plants are growing gently and gracefully. All in the garden seems peaceful and suddenly there is time for the gardener to think! 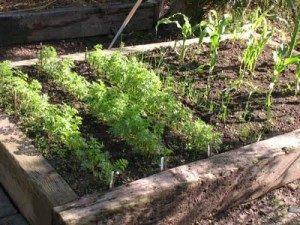 Jobs in the vegetable garden in October can be divided into tidying up or planting fresh veg. 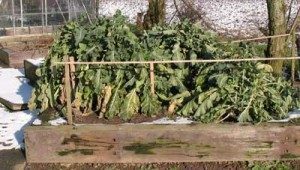 Sow overwintering broad beans such as Aquadulce and ensure you cover them with cloches or fleece so that they are protected from frost and pigeons. Sow carrot varieties Nantes or Autumn King. Plant autumn onion sets and garlic cloves. Dig up outdoor tomato plants, hanging them upside-down in a greenhouse so that the fruits are able to ripen. Don’t worry if some of the fruit doesn’t ripen — they can be used green in chutneys. 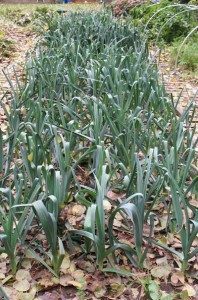 Harvest all vegetables that are susceptible to frosts such as spring onions, parsley and chives. 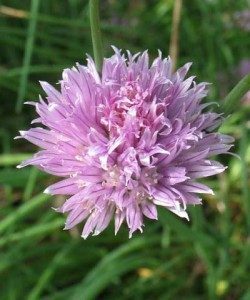 Pot-up chives, mint and parsley so that they can be used throughout the winter months. Maybe we should make an effort to think out of the box! The gardening we have grown up with, and practised year after year, might benefit from a shake-up. Hanging baskets may seem a bit suburban but are a way of contributing to our Grow Your Own supplies and add another dimension to the pleasure of gardening. As well as tumbling tomatoes or strawberries which are often grown in hanging baskets, why not try herbs or peas? A basket of herbs looks and smells beautiful. It would be useful hanging just outside the kitchen window. Marjoram will hang down over the edge, and Chives tend to drape a little too. Various Mints would fill in the centre with Borage providing height. A basket of peas, filled with sugar snap or mange tout would make an interesting spectacle. 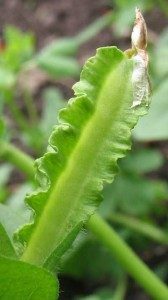 Asparagus peas have a frilly pod which is eaten whole. The pods need to be picked when they are about an inch long before they get stringy, so they are not particularly productive. But they are useful as a garnish. The dark red flowers stand out against the green foliage. So, as the nights draw in in October, and new catalogues arrive, think about different ways of vegetable gardening, as well as what varieties to grow next year.